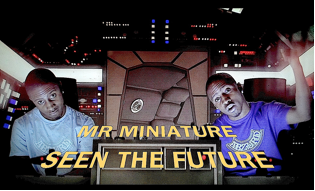 Mr Miniature drops his second release from 'Take It Or Leave It' entitled ‘Seen ‘The Future''. The music video inspired by Star Wars is the follow up to the quirky 'Just Like Me' and is released before Mini's performance at ILUVLIVE Birmingham and hosting at the launch of ILUVLIVE Derby. Mr Miniature aka Deekay has packed a lot in to his 18 years. The Producer/MC born and raised in Peckham, fresh from completing straight A's through college and is now at Leicester Uni studying Economics, he has recently released his 8th mixtape, 'Take It Or Leave It', on his own label Abzurd, with all tracks Written & Produced by himself. As a 14 year old on the grime scene he appeared on freestyles with Kano and Tinie Tempah and went on to feature on BBC 1Xtra DJ Cameo's 'Who Dat' single as well as Logan Sama's Grime Show on Kiss alongside Maxsta. His most recent release 'Just Like Me' saw him added as a BBC Introducing artist with support on BBC 1Xtra's from Semtex, Charlie Sloth & Ace. Touted from many as one of the hottest young MC’s around, Mr Miniature is undoubtedly one of the major talents to look for in 2013.